The time had arrived. Hartnell wanted to move on from the Doctor, but the ratings were great. So, the producers hatched a plan. The Doctor would continue, but renew as a completely different person. And thus began the Patrick Troughton era. Troughton was born in 1920 in Middlesex. He attended the Embassy School of Acting and later joined the Tonbridge Repertory Co. Fun fact: in the TCF production “Escape”, he starred alongside William Hartnell! Two of Troughton’s most famous pre-Doctor Who roles were in Robin Hood (the first to play the title character on TV) and in Jason and the Argonauts (yes, that one, with the Ray Harryhausen monsters and everything). He left the show after four years for fear of typecasting, creating the so-called “Troughton Rule”. In fact, it turned out he was right–all of his roles after Doctor Who were in sci-fi and related genres. The most famous was in The Omen. New opening and “howlaround”. 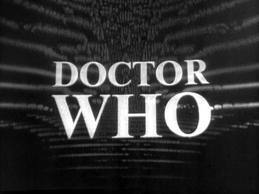 This was also the first time the Doctor’s face appeared in the opening. 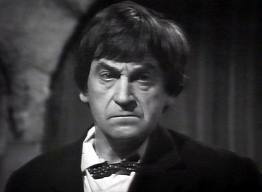 I’m frustrated by the Troughton era. Not because I don’t like it, far from it. There’s just so little available. Troughton is considered the “Doctor’s Doctor.” He’s the one all the succeeding Doctors attempt to emulate. His ability to outsmart the enemy made him fun, along with his mannerisms. I still say he’s worth checking out, in spite of the amount of what you can see. McCrimmon is a Scottish Highlander (no, not that Highlander), and stays with the Doctor the longest. His behavior is that of a gentleman, always protective of the Doctor and any allies. He is an enjoyable character, with his tendency to charge into battle, and I can see why he was so popular. Victoria hails from the 19th century and became a companion when her father was killed by Daleks. There isn’t much I can say about her because the only story I’ve seen her in is “Tomb of the Cybermen”. She didn’t seem interesting to me. Zoe is the first in a long history of intelligent female companions. She supposedly comes from our century (or at least how the 1960’s portrayed it) I love her personality and I’ll admit, she looks great in that catsuit. A refreshing change from the bland or screaming women of Hartnell’s era. Instead of giving you stories to avoid, I’m going to go ahead and recommend all the Troughton stories I’ve seen. There’s less available from the Troughton era than the Hartnell era, and I feel I can’t give a fair assessment of his era. The Doctor: Don’t you see what this is going to mean to all the people who come to serve Klieg the all powerful? Why, no country, no person would dare to have a single thought that was not your own. Eric Klieg’s own conception of the way of life! Eric Klieg: Brilliant! Yes, yes, you’re right. Master of the world. The Doctor: Well now I know you’re mad, I just wanted to make sure. The Doctor and friends meet the Master. (no, not that Master), who has been given the ability to bend the Land of Fiction to his will. This is Troughton at his best, turning his enemy’s flaws to his advantage. This story is written by Terrence Dicks, one of the show’s best writers. It also features the only enemies from the Classic version who haven’t returned, the Ice Warriors. After seeing this episode, I’d love to see them return. This is the grand finale, which introduces the Time Lords and Gallifrey. It’s another excellent Terrence Dicks story. The story sets the stage for the Pertwee era by exiling the Doctor in the 1970’s. The story does lag (it’s over 4 hours long), but still very entertaining.